After almost 2 weeks in Durban, it was time for me to return home alone, leaving my wife and children staying with Granny and Grandpa. I had a rental car to take back to the airport, so our tearful goodbyes were said on the driveway, before I headed out to the airport. Roads were clear and I was soon there, with plenty of time to spare. I had contemplated spending R100 for a visit to the Bidvest Lounge (pre-booking rate) but decided against it - after all I'd have 2 lounges to visit on my return in December. I had some time, so I went outside to look for a Geocache, but with no luck I returned into the terminal. Statue of come cows, that were accompanied by one of the airport's namesake, King Shaka, but was removed as apparently it looked too much like a cow herder. By now it had started to rain heavily, at the old airport boarding was only by stairs, so thankfully we now had air bridges to board. We boarded and I took my seat. Load was good, around 80%, though the middle sear next to me was free. The captain gave an announcement that heavy turbulence was forecast, so no hot drinks would be served, and to expect lots of movement during the flight. We took off to the south, and immediately entered the cloud layer. After a while we entered clear air, and cruised comfortably. Aside from a few small bumps, the ascent was smooth. The crew started their service. The "meal" on board was mini burgers - which were 3 very small bread rolls, two of which contained an inch square piece of cheese (nothing else) and the middle one a similarly sized piece of chicken in a mild periperi sauce. They were ok, nothing special though, and the cheese ones a bit dry. No hamburger patties at all though! Still, slightly better than the birdseed another A.netter was served recently! I took a beer with it. We started our descent, all the while I was expecting major turbulence, but there was very little except when going though the clouds. I spotted a lake below, but my seatmate said that there were no lakes in this area, so it must be cloud. (I later found the Vaal Dam on Google Maps - I was right!) We landed with a jolt and taxied to the domestic terminal, where we parked at a remote stand and boarded busses to the terminal. Bags took a while to come through, as before they had been sealed with cable ties. After thinking this was a Lanseria Airport idea, perhaps it's a Comair (BA and Kulula) idea. My next domestic flight is on Mango, I'll see then if it continues. I picked up my rental car and headed for my brother-in-law's house in Centurion, though the occasional downpour and thunderstorm. The next day I headed back to the airport, and dropped the car off at the rental returns, after filling up at the petrol station that is on the roof of the car park. I headed inside to checkin. I presented my passport, and put my luggage on the scales - it only weight 7kg so no worries about being overweight. 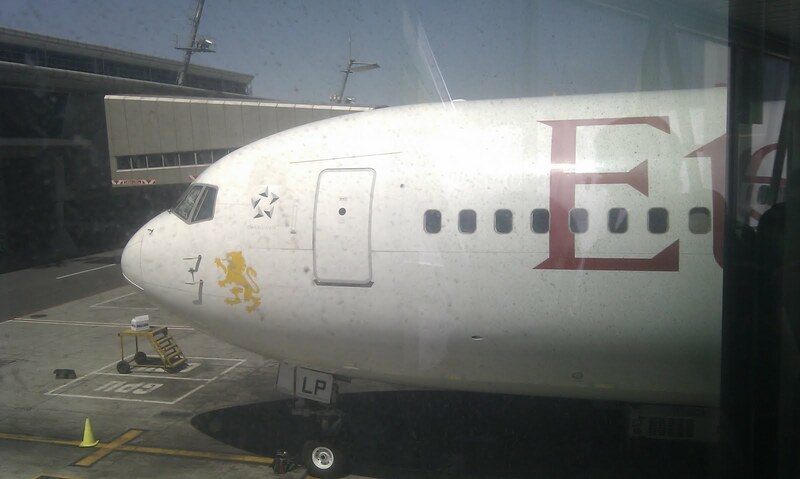 I was given my pre-selected seat that I had guessed was a bulkhead seat, but turned out not to be - Ethiopian publish seat plans on their website of each aircraft, but there was no way to guess what actual aircraft would operate the flight! Still, the more pressing issue was that I could not be issued with a boarding pass for my 2nd flight, ADD-LHR, as this flight had not yet opened. I was advised to ask at the gate. After leaving my bag, I decided to hunt out the viewing decks at the airport. The first was above the International terminal, which involved going down some corridors that appeared to house general office space, not looking promising at all, until it reached the end where the viewing gallery was. The view was great, I managed to get a few good pictures. Cathay Pacific 747 at the gate immediately below the viewing deck. This was the gate that my flight was due to depart from, but didn't, as a BA 747 arrived in the meantime. I'm not sure what it would arrive then, perhaps it was late. I decided by this point to head airside. I used the security point between International and Domestic, that usually is empty, but it seems that more and more people are becoming aware of it. Since the originally allocated gate was by now taken with the BA arrival, our new gate was right at the end of the new pier. Pair of A380s waiting for their return night flights. A 3rd, belonging to EK, was out of shot to the left. A crowd was gathering at the gate, and boarding was called. There was no preboarding announcement for anyone - business class, status passengers, people with children, noone. People did form a kind of queue though. 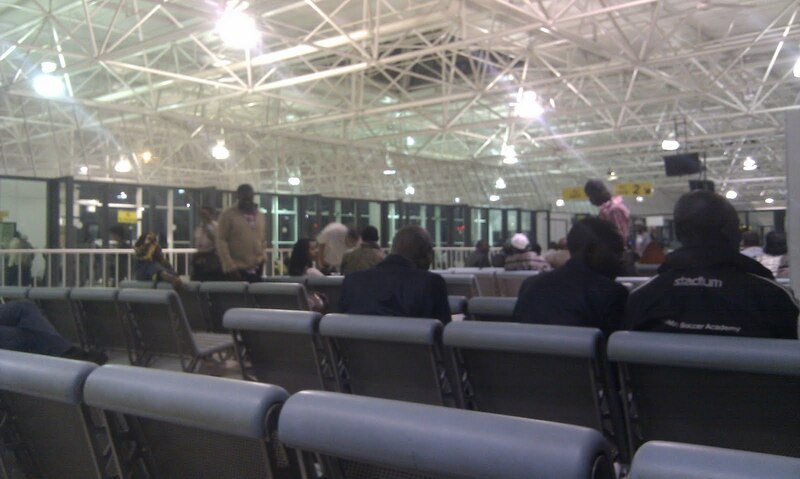 When it was my turn, I asked about my 2nd boarding pass - I would get it on arrival in Addis, I was told. I then headed down the bridge to the aircraft. 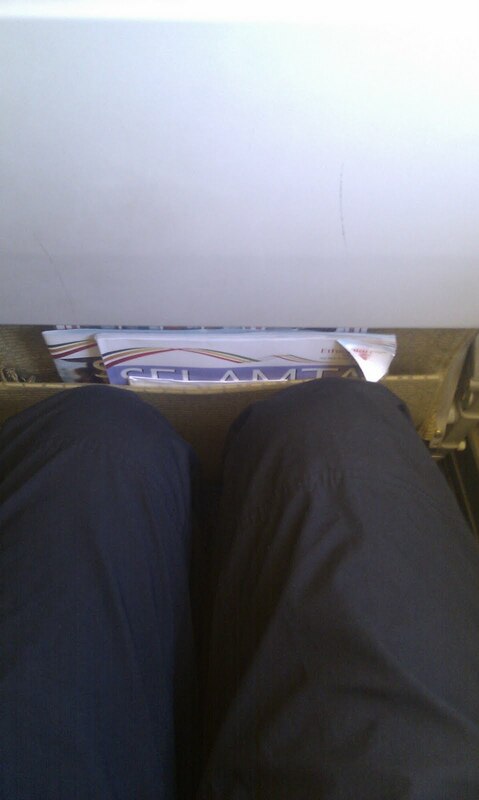 The legroom shot. Not bad. 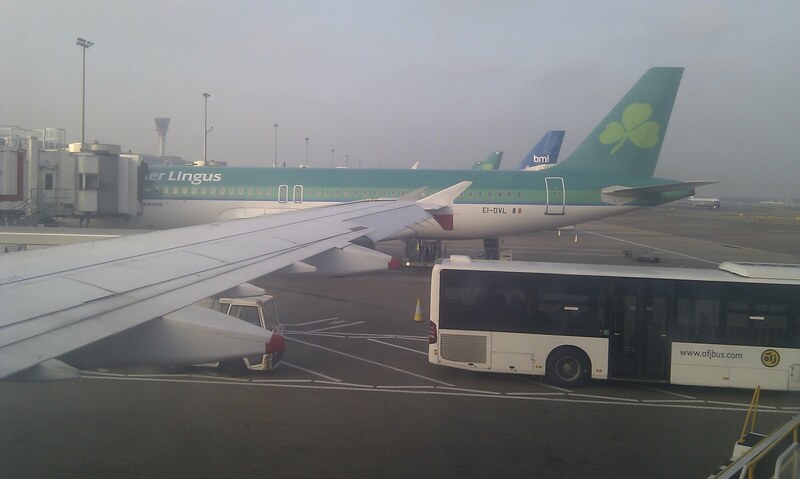 Once everyone was on board, we pushed back, and headed down the taxiway to take off northwards. Load was close to 100%. 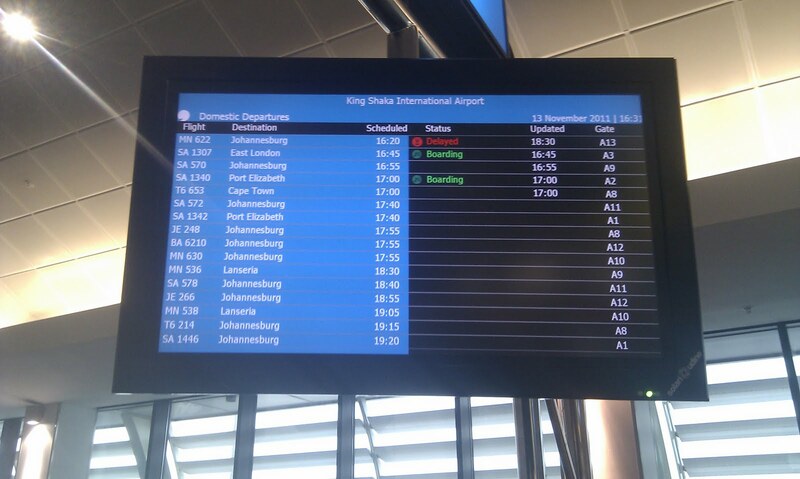 Takeoff wasn't very powerful, though JNB has very long runways. I set my IFE screen to the airshow, and left it there. The system was quite basic, with only about 6 films on loops, so not AVOD. One of the cycles showed the direction of Addis, much like sometimes the direction of Mecca is shown on Muslim airlines, though it seemed to be somewhat pointless as it was almost always directly in front. Not long into the flight, the meal was served, it was quite substantial and of good quality. There were two large pieces of chicken under the tomato sauce. I had a white wine to go with it. After a few hours, a juice round was offered. I spent the time dozing, and watching the airshow, until it got dark, and soon it was time to land. We came in low over the lights of the city, and landed very smoothly. Unlike Nairobi the previous year, there was no mention of any photography ban. As we got off, there were plenty of uniformed staff waiting, so I asked about my boarding pass. They referred me to a desk behind, next to an escalator upwards to the main departure level, instead of the baggage reclaim and exit. I waited here, despite several people pushing in front (including an African lady with a t-shirt with Bible quotes on it), until I was served. I was told to go upstairs to the gate, there I would be given my boarding pass, so upstairs I went. 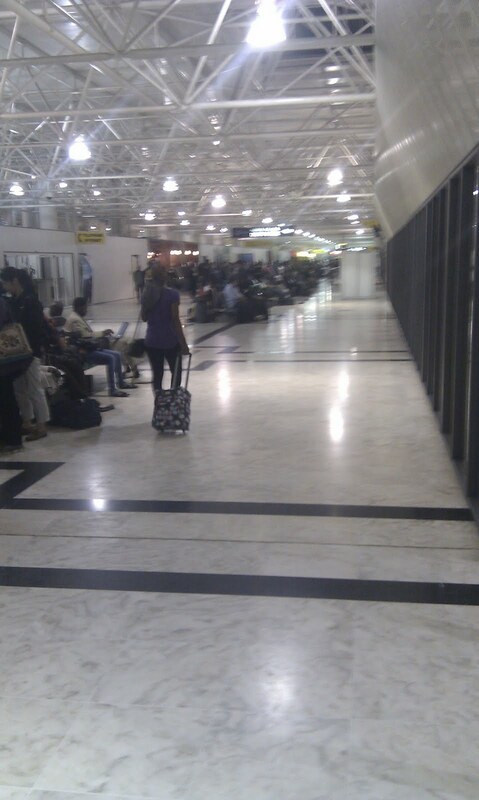 Departure level of Addis Abeba airport, glass wall on the right, behind which are the gates. There are 8 departure gates, in a line, and 2 security points, one at either end of the terminal. The gates themselves are separated from the rest of the departures area by a glass wall, with the 2 security points being the only way to get from the duty free shops area, to the gates. The FIDS told me that the London flight was from gate 2, so there I went. The guy at the security point said no, London was from gate 8, and he showed me a piece of printed paper showing this. So I went to the other security point. No, they said, gate 2 is for London. Still, I went through the security (with several women in Muslim robes pushing in front) and along to gate 2 on the gates side of the wall. At gate 2 was the flight to Tel Aviv, so the agent advised I take a seat and wait, which I did. The Tel Aviv flight left, and an agent came around advising all London passengers to queue and have their documents checked. 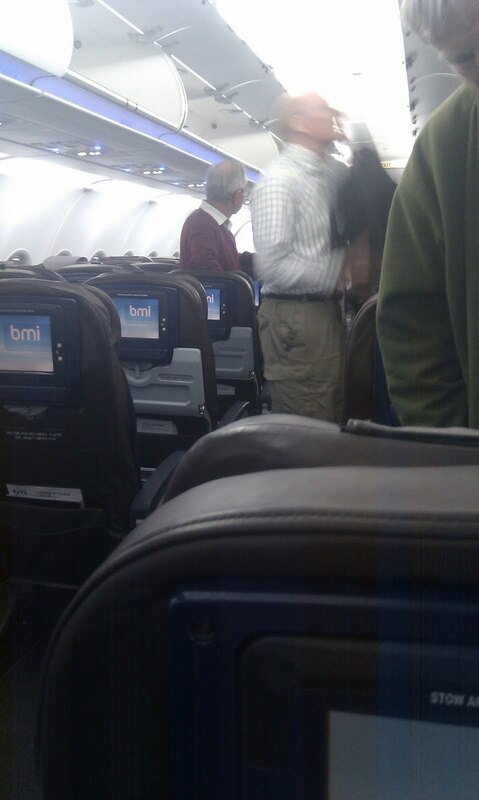 This I did, and by this time one agent (called Benjamin) arrived in BMI uniform. He said to wait, and he would arrange for my boarding pass to be brought here from checkin. Also by now, the flight to Rome and Stockholm was also supposed to be boarding from gate 2, and the 2nd agent was dealing with this flight. Benjamin had taken my passport, and I was a little worried about it, so I stood near the desk. Rome and Stockholm passengers' boarding passes were checked, and they were invited to board through the door (or rather, downward stairs) at gate 1, despite the paperwork being dealt with at gate 2. 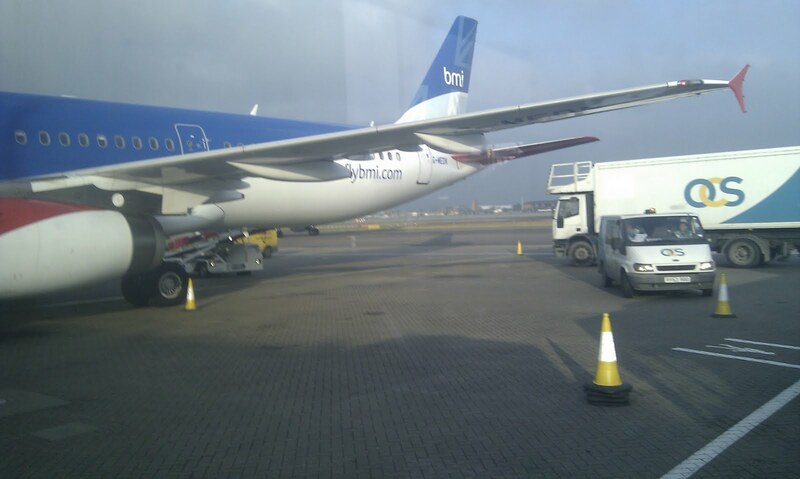 By this time, a BMI A321 had arrived at the gate. Benjamin disappeared down the airbridge, but I'd got my passport back before that. 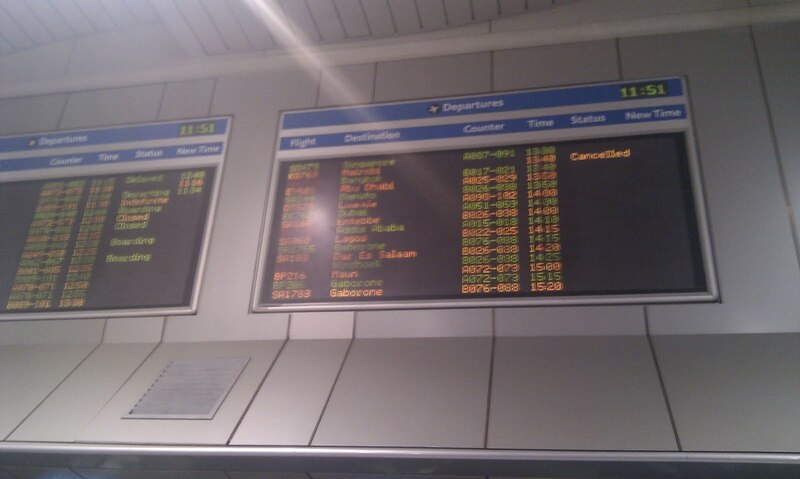 By now the scheduled departure time had been passed by almost an hour. Benjamin came back holding a boarding pass, mine! The other agent had started the boarding process, when people started coming back up the bridge into the departure area. 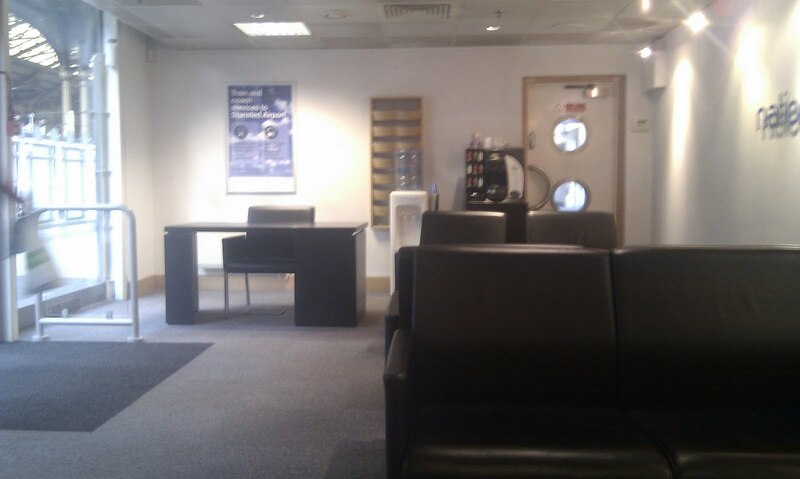 Noone knew anything, and we were all advised to sit and wait. After another 30 mins or so, we could all board again, those whose boarding passes had been torn off as well as those (like me) who hadn't got this far yet. I hadn't been given my pre-selected window seat, instead I had been given the aisle, but I wasn't complaining at this point. Anyway, once we were all aboard, it became apparent that there were no more than 30 people on the A321, most of them belonging to a large family group. The captain came on the tannoy to apologise for the delay, saying there was a computer problem and they rebooted the system and it appeared to be working again. We pushed back, and waited for a while until the captain again came on and said the same issue had reoccurred, and that we would be returning to stand for an engineer to come and look. This happened, the system was rebooted again, and we pushed back again. 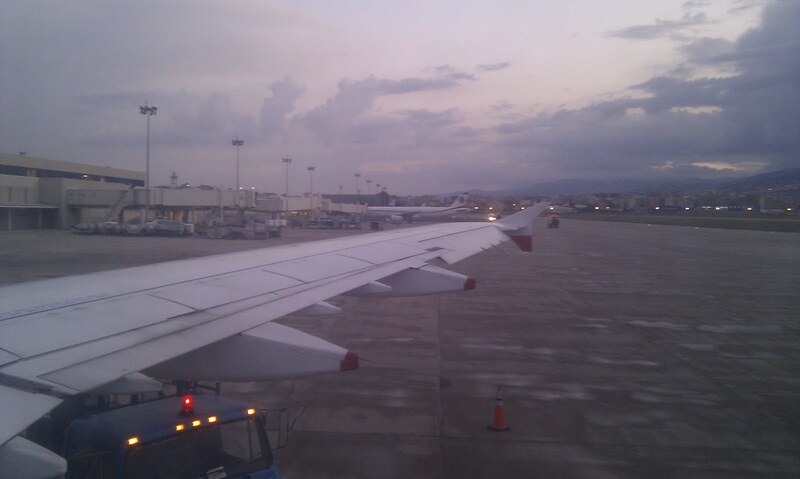 This time the problem did not reoccurr, so we were ready to take off, only 3 hours late. I wasn't too worried about the delay, as originally the flight was due to go via Amman, leaving 6 hours later than now, so I had pre-booked a train ticket home from London leaving plenty of time. Once airborne, the drinks service began, followed by the meal service. I had a G&T (dedicated to Gabrielchew), only the one though, despite the steward offering me a 2nd G and an 2nd T.
Then came the meal, a type of pancake containing scrambled egg. Not bad tasting. I then put the airshow on the IFE. Our route was rather strange, in that we headed almost due east to the Red Sea, then followed the sea northwards. Does BMI have a problem with both Sudan and Eritrea? 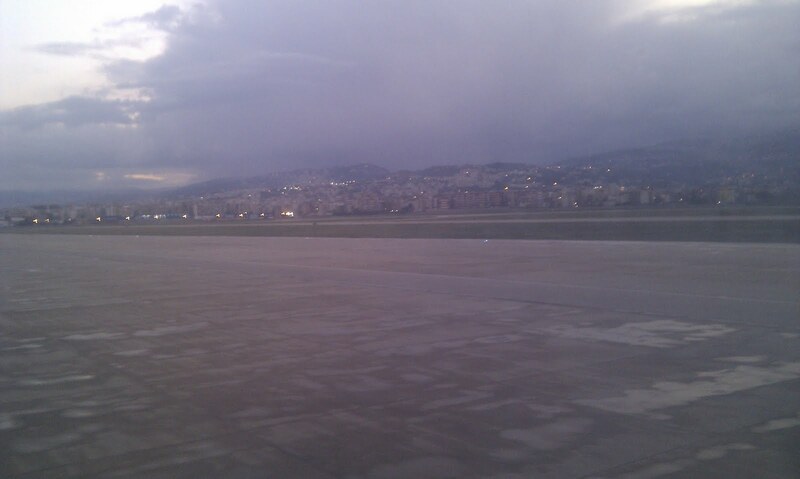 I then fell asleep, and woke as we arrived into Beirut. The crew changed here, they had spent a few days here before doing a round trip to Addis. Our steward was a young French guy, he was chatting to the one passenger in the row in front of me, as the rear-facing crew seat at the exit row was facing him. His place was taken by a Spanish lady. As for the other seats, the load jumped to almost 100%. A father and son (who was probably about 8) had the seats next to me, the father asked if he could have the aisle. Of course I complied, and moved to the window seat. We took off towards the sea, and climbed through the cloud layer. Another cooked breakfast was served, an omlette this time with sausages (that tasted like beef sausages), the rest of the meal was identical though. I took a juice this time, no more alcohol for me as I was working that night! 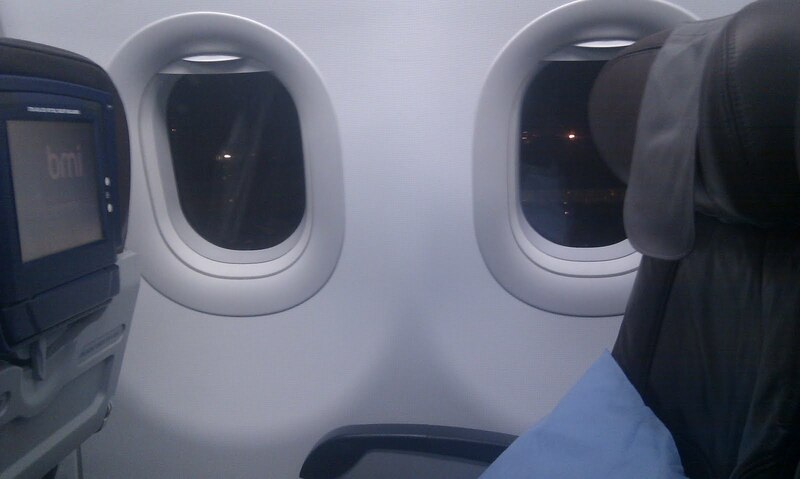 I spent most of the flight dozing. As we approached London, we were put in a holding pattern above the East End, with occasioally the Olympic site poking through the clouds. We then headed westwards accross north London, to approach Heathrow from the west, coming in to land smoothly. The boy seated next to me started to vomit though - his father handed him a plastic bag, it looked like it might have safety holes in it though so I handed him an air sickness bag from the seat pocket. In the end, I think he must have had a bug of some sort, as I was sick with it a couple of days later. We were soon on stand at Terminal 1. Arrived on stand, notice the bus. We disembarked through the jetbridge, but were led down some stairs to the waiting bus. I assume the aircraft was next to be used on a domestic or Dublin flight. The bus drove under the bowels of Terminal 1 to another part, where we entered. Our aircraft from the bus. Other side was the Lufthansa retrojet. Baggage took an age to arrive, but it did eventually, and the queue for passport control was huge, except I used one of the E-gates with had a queue of 1, and I passed through quickly. That is almost all, though I took one jumper with me to South Africa (it was summer after all) but I couldn't find it when packing. So I arrived into winter England wearing a t-shirt and a light rain jacket. I took the bus from Heathrow to Feltham where I bought a thick jumper from Asda, and had a cup of tea in McDonalds (after a fortnight of foreign tea, even McDo's PG Tips was lovely!). I arranged to meet my sister in Shepherds Bush, as she was in London for a few days, and we had lunch in Pho noodle bar in the Westfield Centre. Then I took the tube to Liverpool St Station, for the train home. 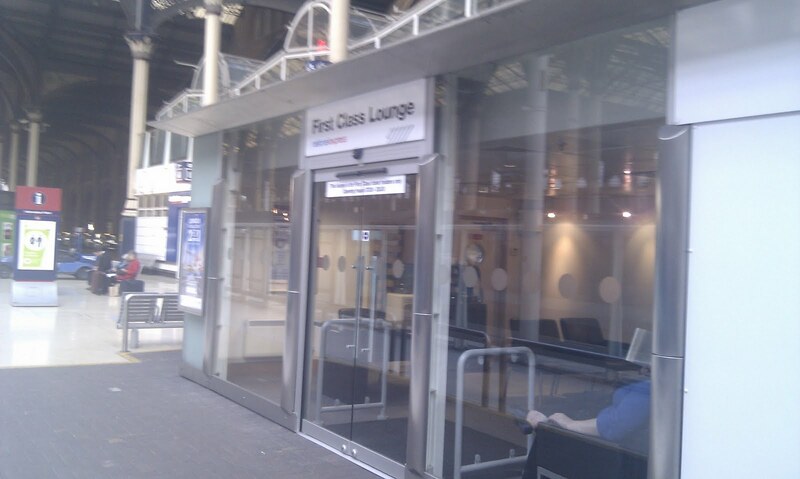 I'd pre-booked a cheap First Class ticket, that allowed me to use the lounge at the station. The ticket cost £12, booked in advance, compared to over £90 bought on the day. Offerings were a hot drinks machine (but no milk to put into the tea) or water. My train. The loco stays at one end, either pushing or pulling the train. I tried to sleep on the train, but the continued announcements over the tannoy prevented this. Still, I got home after walking from Norwich station, got into my car and drove to work for a night shift, which was completely knackering. very nice and excellent information about travel are u provide me by your blog. Nice collection of images and i like it. If u know about LED lighting so see my website SecondSunLab that provide excellent numbers of LED grow lights range vary 600mx,900mx and 1200mx.